Here at Troy Cider, we celebrate the rich heritage of the apple industry in beautiful Sonoma County California. We forage incredibly complex fruit grown on the abandoned land of this world famous wine region, which provides us with the most incredible raw materials for our healthful living beverages. We cold press late harvest heirloom varieties into delicious juice, which is then fermented with only native yeast and plenty of patience. After nearly one year in oak barrels at our rustic Sonoma cidery, we hand bottle every last unfiltered drop without the use of sulfites….pasteurization….or any other preservative methods. Ready for you to shake, pour, and enjoy! Welcome to the wonderful world of Troy Cider! Meet the artist behind our delicious organic creations, his name is Troy Carter. While cruising by motorcycle through abandoned apple orchards in Sonoma County, Troy discovered the most incredible heirloom fruit being grown on 100 year old trees amidst the many grape vines that have overtaken the area. Every one of our barrels achieves that elusive, terroir-defining balance of wild yeast, sea salt, and hay bales — and of course that special barnyard essence. It is said that the apple doesn’t fall far from the tree, imagine then what happens to an abandoned orchard after more than 60 years of neglect. The result is an overgrown forest of gnarly old trees left to fend for themselves….bearing fruit with no names….fruit that has not seen human hands….fruit that has flourished without irrigation or pesticides…fruit that tastes like no other. Wild orchards cover thousands of acres in Northern California, and are the inspiration for our natural ciders. Darek Trowbridge has had a passion for fermenting beverages throughout his whole life. Darek began studying wine at a young age with his grandfather, Lino Martinelli who, like his father, Giuseppe, was growing grapes locally in Sonoma. Lino taught Darek the “old world” style of winemaking with the consideration that everything a vintner does in the vineyard and in the winery affects the flavors of the wines. Darek now uses what his grandfather taught him as a basis to make the best cider possible. Old, overgrown apple orchards were everywhere Troy looked when he took a post-college motorcycle trek along the back roads of California’s Sonoma Coast. Planted in the 1950s, these archaic trees had been fending for themselves in the generations since wine arrived. Troy treasured the funky characteristics associated with artisanal cider and guessed that these ugly apples would be the perfect raw material for his favorite libation. An orchard owner told him he could pick all he could carry. And so it began, Troy Cider was first pressed during harvest season in 2012. Cider expert. Lover of well made beverages. Protector of Sonoma apple trees. Drawn to the natural style behind Troy Cider, Mark joined the business during the spring of 2014. Since joining the business, Mark has expanded our footprint across America and beyond. 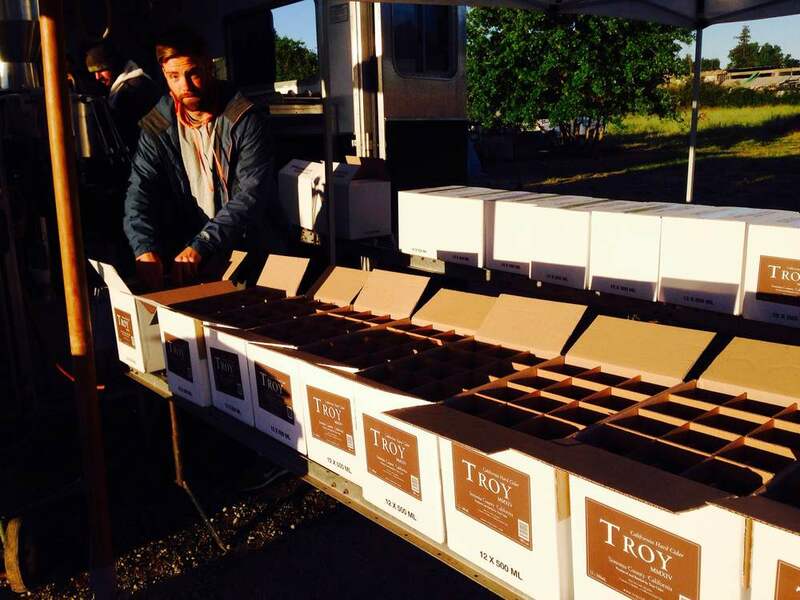 Cider fans may now enjoy Troy Cider in over 30 states, and also in Canada. Mark has a vision to keep our brand small, but also to make our ciders available in the leading cider destinations around the world.